Spending Your December: A To-Do List For Adventuring Through The Most Magical Month of The Year. | The girl who loved to write about life. 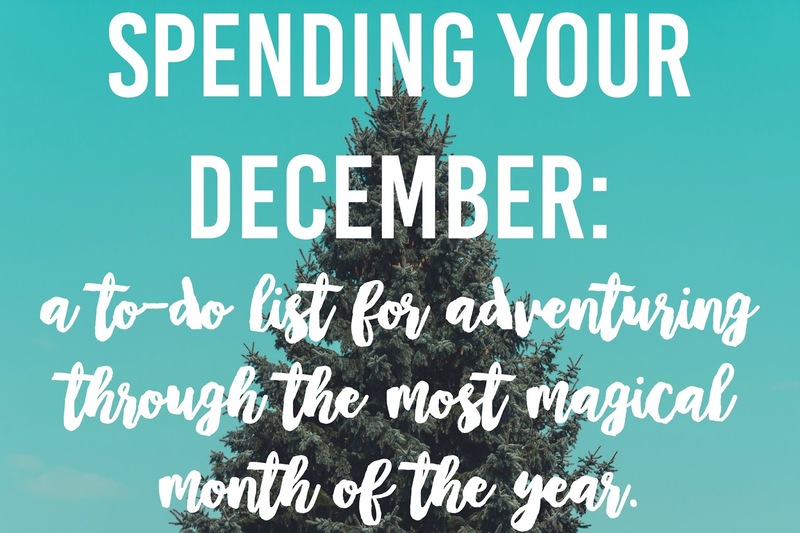 Spending Your December: A To-Do List For Adventuring Through The Most Magical Month of The Year. The most magical month of the entire year is here! We get 31 beautiful days this month and we get to choose how to spend them. Of course, I have some suggestions. 1. Start an Advent calendar. 2. Decorate your space for Christmas. 3. Get your pet a Christmas sweater. This one lights up. You're welcome. 4. Make hot chocolate. Not just from a packet, either. Get fancy with it. 7. Leave a secret Santa gift. 8. Donate to a family in need. It doesn't have to be extravagant to help. Most of us probably have things in our pantry we could spare that a food bank would happily take. 9. Go through ____ in preparation of incoming gifts. Asking for clothes for Christmas? Get rid of the ones you don't wear anymore. Know your kid will get a bunch of toys? Throw out the broken ones, donate the ones she doesn't play with anymore. 10. Watch a Christmas movie you've never seen. I will happily give you allll my recommendations. 11. Look up Christmas-y things in your town. 12. Listen to Christmas music by a fire. My personal definition of cozy. 13. Make a fun day out of Christmas shopping. Grab lunch somewhere fun, listen to Christmas music on the way, grab a peppermint mocha...'tis the season. 15. Go look at Christmas lights. 16. Play Dirty Santa. Even if you have to throw a party of your own to make this happen. . .worth it. 17. Give someone a Christmas card that wouldn't expect it. A maintenance worker, your mail lady, the cashier at Publix. . .the possibilities are pretty endless with this one. 18. Go see Santa. Borrow a child if you must. 20. Have a Christmas dinner party. Whether this means you invite all your friends over or just cook some festive things for yourself, do whatever you'll enjoy the most! 21. Clean your house. Either you'll be happy to spend Christmas in a clean home, or you'll be happy to return to a clean home from wherever you spent Christmas. 22. Read the Christmas story. 23. Go to a Christmas service. No matter what your faith, there is something magical about attending a Christmas service. 24. Celebrate Christmas Eve. The best day! 26. Be the laziest. Look, no one gets anything done the day after Christmas. Embrace it. 27. Do something to avoid the post-holiday blues. Whether this means go to the gym or go to your favorite restaurant, do something that makes you happy! 28. Exchange any gifts you need to. It's not fun, just get it over with. 29. Think about your goals for 2018. 30. Write 2017 a letter. A love letter, some hate mail, whatever you need to do. 31. Celebrate New Year's Eve! How will you be spending your December? Here's Your Reminder to Stop and Savor.